This updated feature-film take on the hit 1980s television show follows a group of Iraq War veterans on the run from U.S. military forces while they try to clear their names after being framed for a crime they didn't commit. Along the way, Col. Hannibal Smith, Capt. H.M. "Howling Mad" Murdock , Sgt. Bosco "B.A." Baracus and Lt. Templeton "Faceman" Peck help out various people they encounter. 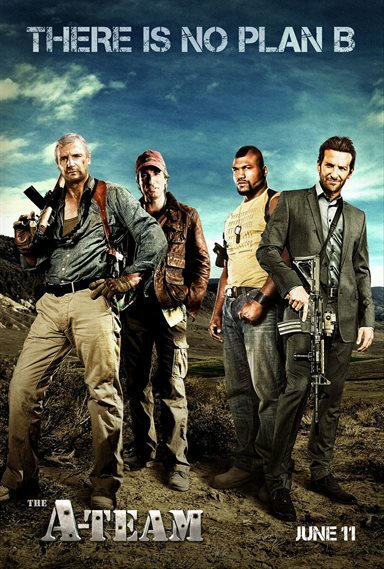 Joe Carnahan directs this high-octane actioner. 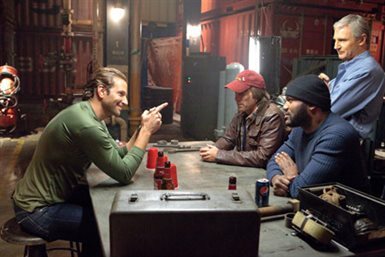 Download The A-Team in Digital HD from the iTunes store. The A-Team images are © 20th Century Fox. All Rights Reserved. When I heard Hollywood was once again plundering my childhood memories with a movie revival of an old TV show, I thought "you can have it". I was mildly interested that MMA fighter Quentin 'Rampage' Jackson would be starring as Mr. T, so to speak. I wondered if there was any remote possibility he could act -- not that there are such great demands on the role of B.A. Baracus. I also wondered just how bad it would be. I expected awfulness, and I waited the entire hundred and seventeen minute runtime for it to happen. To say that the movie is not realistic is an understatement, and the film pays careful enough attention to the over-the-top source material to guarantee this, such that if you are following the formula, you will see several key points coming before they happen. In the end, none of that mattered. The movie knows that this "A-Team" specializes in the absurd, and embraces the nonsense. They are not an ordinary unit, and the script does not try for a second to pretend they are. Although the movie is not bloodthirsty, the group has no compunctions about killing if they have to; the bad guys are, after all, even worse. In fact, it is with the bad guys that there are several distinct and differing degrees of competence and malice that make the show crackle…watching one of the worst of "them" in the hands of the other bad guy and how disgusted he is with their incompetence that he lectures them on how to properly execute him, would, in a lesser scene, be cringe inducing – but here it was funny. I have heard people say that the plot makes no sense; I have to agree. Did they get from Germany to LA in a day and a half? Maybe, but I would have to watch it again to be sure. But the personalities and chemistry between the principles matter more. Liam Neeson and Bradley Cooper play their parts believably, but it is Jackson who is tasked with the heavy lifting as Baracus, and he rises to the challenge marvelously. I do not see him being a major actor or even action star, but he has the screen presence to hold on to audience attention. The A-Team is definitely a summer movie without pretensions to anything but over-the-top action, but it is as well-defined within this identity as any film. You get to root for the good guys, enjoy the explosions, and hang on for the ride. If Hollywood is going to keep pumping these out, they could do much, much worse. The A-Team images © 20th Century Fox. All Rights Reserved.